Today my daughter's great-grandfather was buried. He passed away this weekend after a long and full life. Bop was quite a character, always with a story about how things used to be only a nickel, or better made. He built his own house in the 1950s, and that's where he died. He was a plasterer at a time when fine craftsmanship was valued more than expediency. Just today I was looking around at the house where I spent so much time when I was married....beautiful carved moldings from plaster...intricate archways...all hand-done by him and his father. When I was first married, I wanted to have a grouping of wedding pictures of all of both mine and my husband's side of the family. The first picture I hung was of Nana and Boppie. No other picture was ever added because somehow any other picture would have ruined the display. 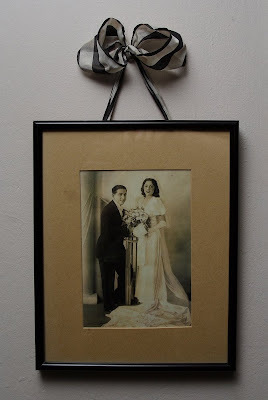 To this day, 10 years after my divorce from Bop's grandson, his wedding picture still hangs on my bedroom wall. What a beautiful photo. I am sorry for the loss of oral history. What a great photo - and what wonderful memories... those never die. What a sad day, but what a beautiful ode to your Bop. It is so nice that you appreciate him the thoughtful way that you do. & this is a beautiful photograph.